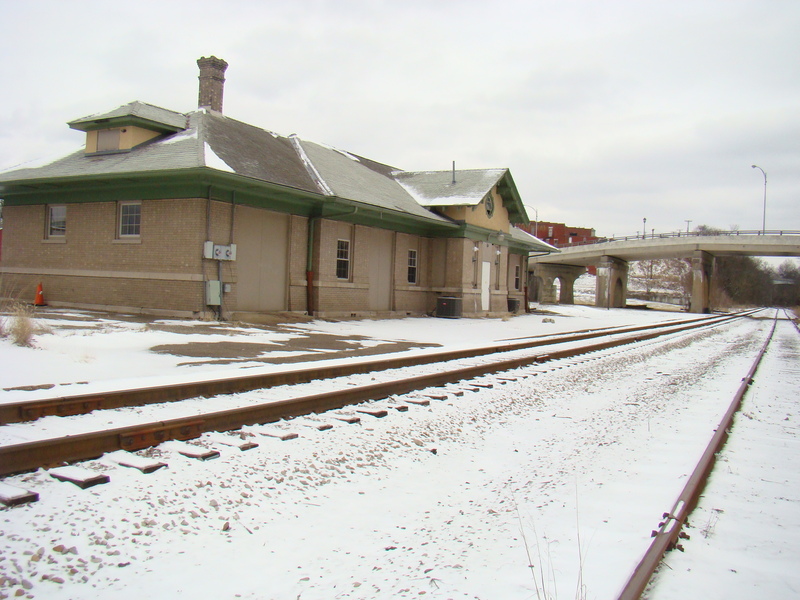 Long ago the railroad station at Cambridge, Ohio was a hub of activity. 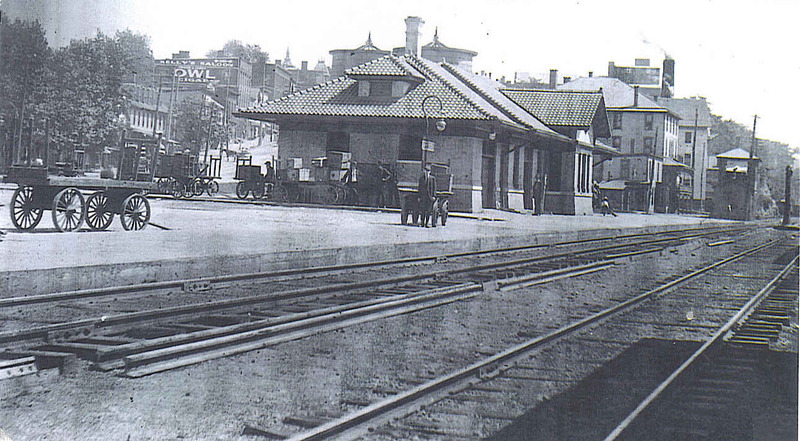 Originally, the Baltimore & Ohio Depot was located on the first floor of the Depot Hotel at 444 Wheeling Avenue. However, the most recent railroad station, Cambridge Union Station, was built by the B & O and Pennsylvania Railroads in 1907. According to local train historian, Dave Adair, this special railroad station had an identical twin built by B&O Railroad at Washington, Indiana. Today Cambridge Union Station remains along the tracks, but stops are no longer made there…only memories remain. Deliveries of mail and goods were made at the train depot around the clock for fifty-four years. Mail was placed in a mail cart, then pulled by mule up the hill to the post office, which was then located where Pavlov’s Music is today. Orders placed at Sears or Montgomery Ward were usually delivered the next day, and often residents would eagerly wait by the tracks for their arrival. For those who could not meet the train, delivery services, like those run by Billy Singer, met the train daily for home deliveries. Imagine the thrill of a memorable school field trip on the train. Such was the case with first grade students from Glass Plant School, who enjoyed riding the rails to New Concord. There they visited the home of their teacher, Miss Daniels, enjoying milk and cookies along with a view of her flower garden. Before the return trip to school, a walking tour of Muskingum College campus impressed the youngsters. My family would drive to town in their pick-up truck to get cardboard cartons of baby chicks that arrived on the train. Mom always went along to stop at Thompson Feed Mill for feed for the chickens. She wanted to be sure to get feed sacks that would match the ones she was using to make some kitchen curtains or pillowcases. Those were the days when people used the train instead of an automobile for trips to far off Zanesville and even Columbus. A friend recalled the thrill of riding the rails to Zanesville to visit her eye doctor. Another remembered trips to Lazarus in Columbus via the train as a family adventure. Dad often talked of hopping on the train to Chicago. Back in 1958, the cost of a one way ticket was $19.85, which included an overnight Pullman car. Have to wonder if in his younger days, Dad rode in the Pullman or perhaps in a boxcar? While the tracks are still active today, no stops are made at the lonesome depot. 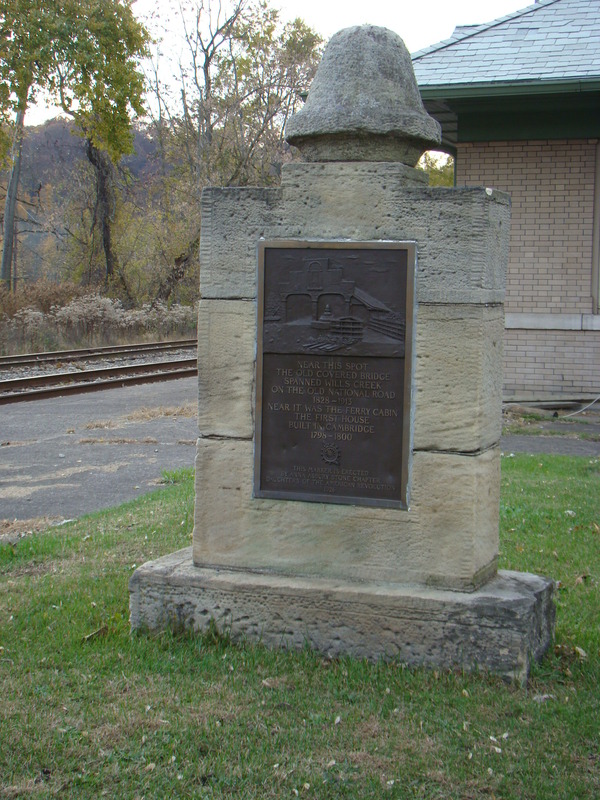 Outside the depot stands a memorial placed there in 1926 by the Daughters of the American Revolution to remind visitors of the beginnings of Cambridge. In the earliest times, crossing of Wills Creek was made by ferry, the first real business in Cambridge. Nearby, Ezra Graham established Ferry Cabin, the first house built in Cambridge back in 1798. Crossing Wills Creek near the station, was the original Double Covered Bridge that carried people and animals down the Old National Trail from 1828-1913. That early bridge was somewhat dangerous to cross as the timbers often were displaced by floods, causing the bridge to frequently lean. Cost to cross the bridge was twelve cents. Soon nearby, a tavern and hotel were built and Cambridge got its beginnings. Union Station is still a great place to visit and feel the old memories that live there. Once in a while a train passes by so you might get a friendly wave from the engineer. As you stroll around the depot, notice the viaduct where that double covered bridge used to cross. Let your eyes wander to Wills Creek and imagine a steamboat going down those waters. Life then was certainly different than what we experience now. 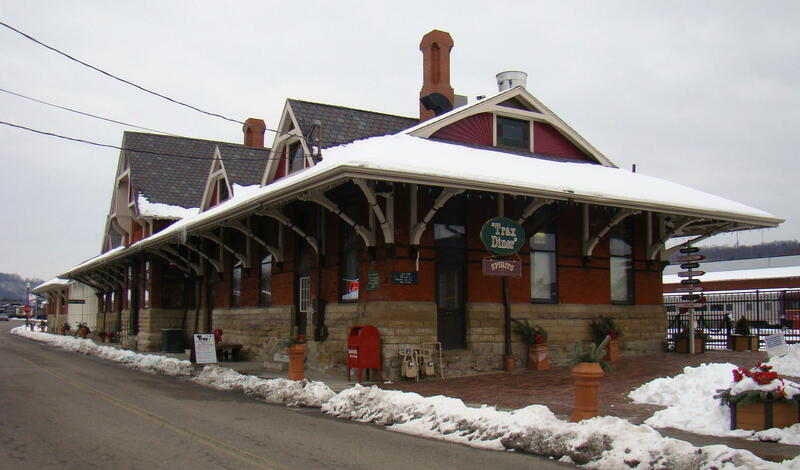 Cambridge Union Station is located in Cambridge, Ohio just off Route 40, the Old National Road. 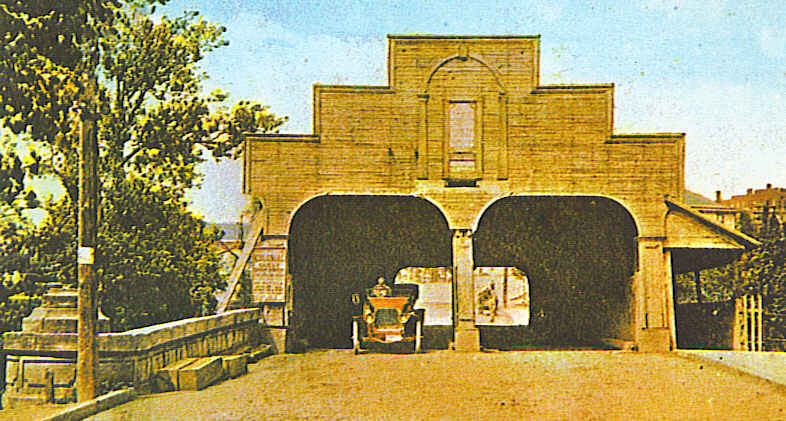 It sets on the west side of the present viaduct near the corner of Wheeling Avenue and 4th Street. Since it is right along the railroad tracks, you can’t miss it! 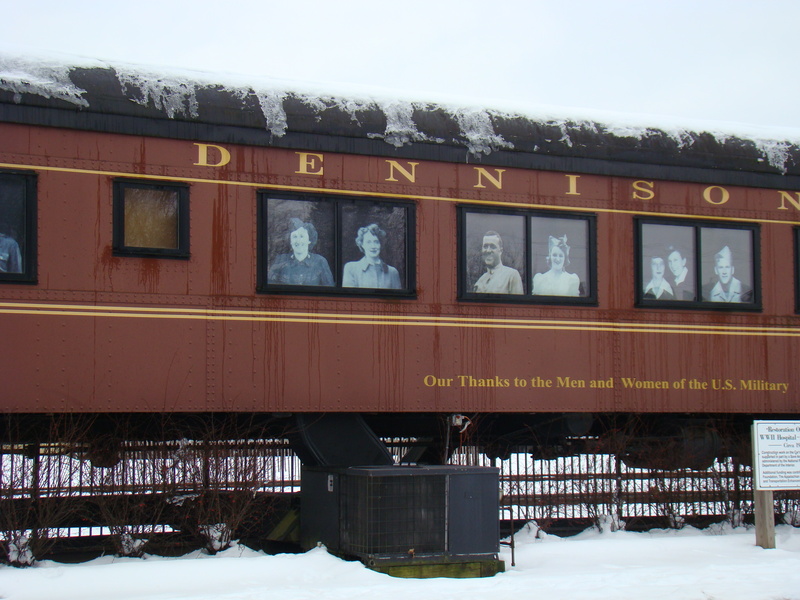 Explore Dennison Depot Museum WWII Dreamsville U.S.A.
Dennison Depot Museum in Dennison, Ohio displays the history of their depot in a rather unusual manner…in the cars of a train! Each car displays a particular section of interest varying from hospital car to telegraph office. There is much to explore and all is well marked with explanations. Why would they have decided to buy the land to establish a town, where none existed, in this particular place back in 1865? Well, it wasn’t by chance! The spot they later named Dennison was exactly 100 miles between Pittsburgh, PA and Columbus, OH. The steam engines of that time could only travel a hundred miles before needing water, so this became their mid-way stop. Approximately forty trains stopped here daily during its peak, when Dennison had the most complete and largest railway yard in the nation. This model train lay-out shows in great detail part of that yard, and is maintained by a group of local model train enthusiasts. 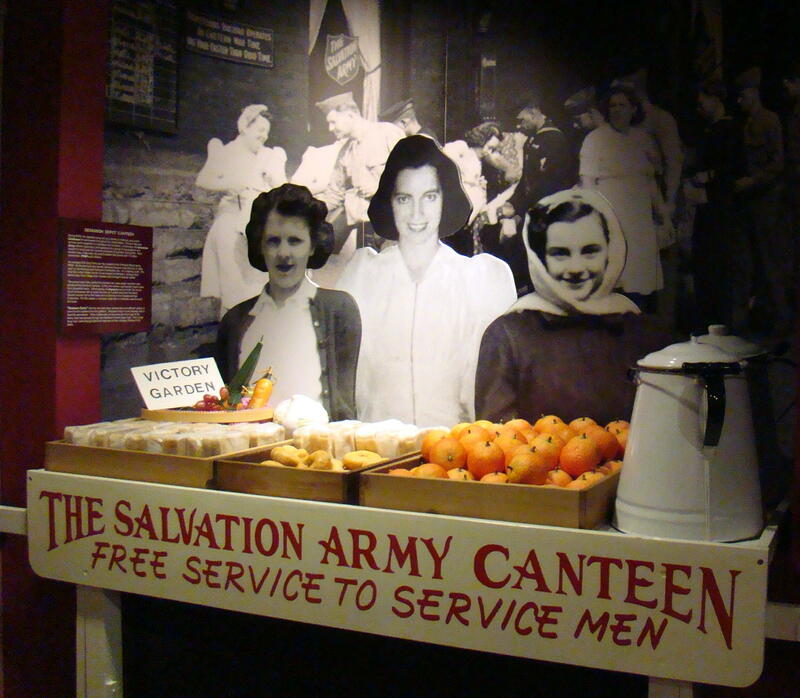 Most exciting of all seemed to be the story of how they became known as Dreamsville, U.S.A. During WWII, the Salvation Army Canteen ,with nearly 4,000 volunteers, provided free food to around 1.3 million servicemen. The train stops were only five to seven minutes long, so the girls went out on the platform to meet the train. They could see the loneliness, hunger and despair on the soldiers’ faces, so those young girls tried to have a smile and a kind word for everyone. The soldiers said it brought back fond memories of their hometowns. These friendly, smiling girls reminded them of their moms, sisters, or girlfriends…plus there was free food. A dream come true! Thus the name Dreamsville, USA. Because of all the trains, Dennison was a hotbed of hobo activity. Whenever a train would stop, many hobos would hop off looking for a place to get handouts. It was common practice for the hobos to make marks on a nearby tree or on the house itself, so other hobos would know if they would be well received. Marks of simple circles, arrows, or even animals signified: Good road to follow. Free telephone. House is well guarded. A kind old lady. They even had a camp along the Pennsylvania Railroad in the city dump, where they made makeshift shelter of tin wrapped around tree trunks. Friendly volunteers patiently answered questions, making the day enjoyable as well as informative. Boarding takes place here for the Polar Express, which during the Christmas season takes children on a magical ride where they encounter Santa. Special events are scheduled throughout the year from Private Bulldog Bing’s Birthday Party to Ghost Tours in the fall. After visiting the museum, the Trax Diner, located in the old depot, is a perfect place for a meal or a snack. Children were full of “whoo-whoos” while they were enjoying the atmosphere. Although they have delicious full-course meals, I chose a “Hobo Basket” filled with British style beer battered fish and chips. Since an English lady operates the diner, this seemed like a logical and delicious choice. “Coal Cars”, stuffed potato skins, also chugged across the menu. Might have to return for “The Caboose”, a sugar and cinnamon shell filled with ice cream and toppings. 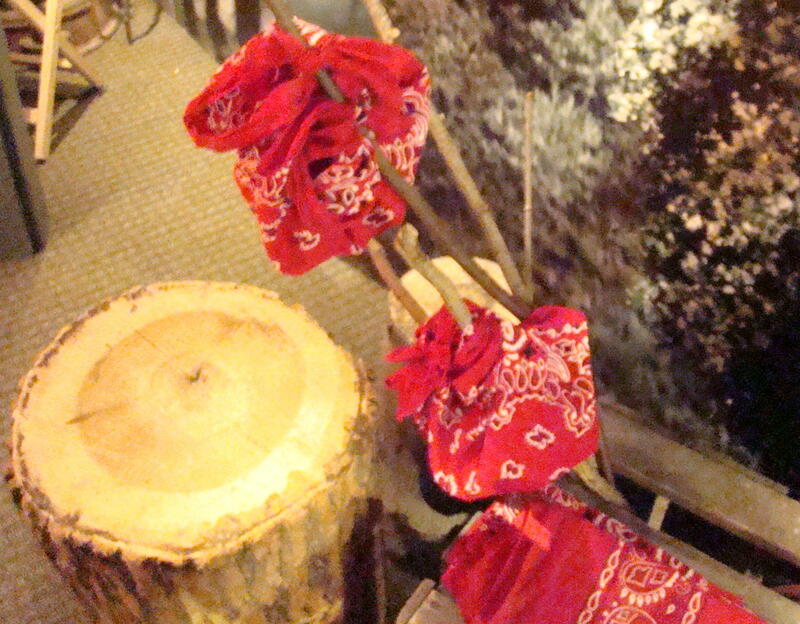 Think a Caboose would be a perfect ending for a meal, a train… or a blog post! Dennison Depot Museum is located in Dennison, Ohio not far from I-77. Take exit 81, 36 East, to the Dennison exit. Turn right on Second Street and continue on Second Street until you reach the tracks. Turn left on Center Street and after two blocks you will see the museum. Parking is on the left side of the street.